Despite pitmaster Brad Orrison's over-sized personality, The Shed's Southern Sweet sauce treads standard ground wind a ubiquitous sweet tomato tang and smokiness, but does it a notch better than other supermarket staples. "Come get fed at The Shed," as the straw-hat-wearing owner Brad Orrison likes to proclaim with oversized exuberance. That over-the-top personality flows into the history of The Shed, which unlike most stories that start with a home cook wanting to make the leap to pro, Brad's begins with a pile of trash. Turns out this dumpster-diver had collected so much junk that he was unwilling to part with that he decided to build a barbecue restaurant out of it all. To have a restaurant though, he needed to learn the art of slow-smoking meat, which is how Brad got into the game. His family business has expanded to three restaurants since the first one opened in Ocean Springs, MS in 2001, and the reach of his line-up of barbecue sauces and rubs seems to be constantly expanding—showing up this year on the shelves of my local grocery in New York for the first time. The Shed Southern Sweet stands alongside the most ubiquitous of supermarket staple barbecue sauces—a sweet molasses and tomato aroma with a tinge of vinegar and a smokiness that should make you think of smoked meat, but in reality is kind of like standing too close to the fire and get a nose full of smoke. Hints of onion and garlic are in there too, but behind the dominent molasses and liquid smoke, it's hard to really make out much else. Continuing the standard sauce trend, this one weighs in right in the middle of the thickness scale—thin enough that the sauce flows quickly and freely from a suspended spoon, but thick enough to leave a substantial layer left clinging to the silverware. Its texture is super smooth, and even through its dark maroon color, you can still make out some specs of black pepper and other spices here and there. This sauce has a sweet start with a strong molasses flavor paired with a tomato base. The sugar is quickly met with a hefty hit of vinegar that almost immediately tingles the tongue. From there the liquid smoke begins to leave is distinct, heavy-handed mark, but there are fading notes of garlic, mustard, and onion that make a brief appearance. As the sweetness begins its final retreat and the smoke is puffing its chest larger and larger, a slight heat pops up and leaves you with a smokey and spicy finish. The sauce coated the chicken more lightly than I would have expected, but it baked in well and ended with a nice looking leg that had patches of caramelized sauce. The flavor swung toward the sweeter side, with the molasses strengthening. Vinegar also seemed to pop more after being cooked, backing down the liquid smoke to a level I'm more comfortable with. Overall it had a pleasing standard barbecue flavor that left me with sticky fingers I was happy to lick clean. Knowing the oversized personality of Brad Orrison, I had an expectation that this sauce might follow suit. Instead, it's a rather standard mix of molasses, tomato, vinegar, and smoke that you can find in the most common supermarket sauces, although The Shed does it a notch better. 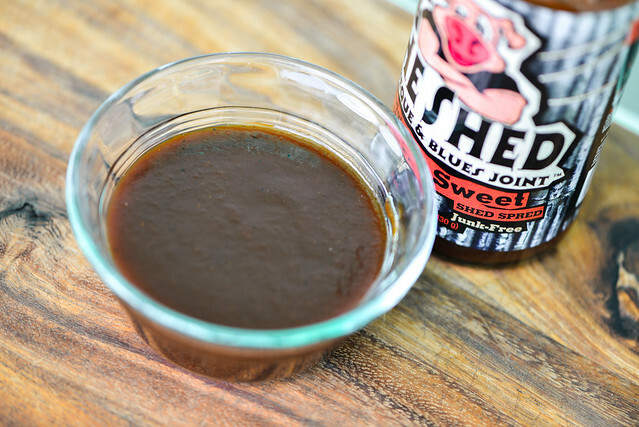 Readers of this blog know I have a beef with liquid smoke, and I could have done without its presence out the jar, but it seemed just right after being cooked. That being said, I found the smokiness more tempered and balanced than other sauces that use this ingredient. The sauce served pretty equally well out of the jar and cooked, and its ubiquitous flavor makes it a go-to, all-purpose sauce, ready to handle you chicken, ribs, pork, beef, or anything else you want to throw at it. I tried the spicy version of this one and liked it a good bit. This sauce is not very good. I'd give it a 4.5 out of 10. I give Sweet Baby Ray's a 7, and Garland's Secret Six Brown Sugar a 8, for reference. 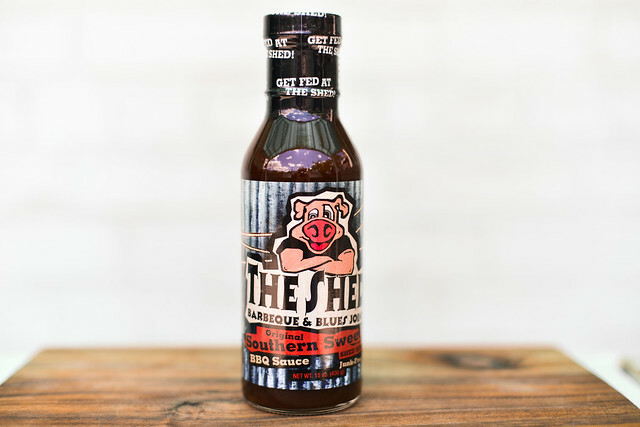 The Shed's sauce has a 'weird' taste in it, possibly a coffee taste? Not good at all. Hate to say it Rob, but you're crazy. 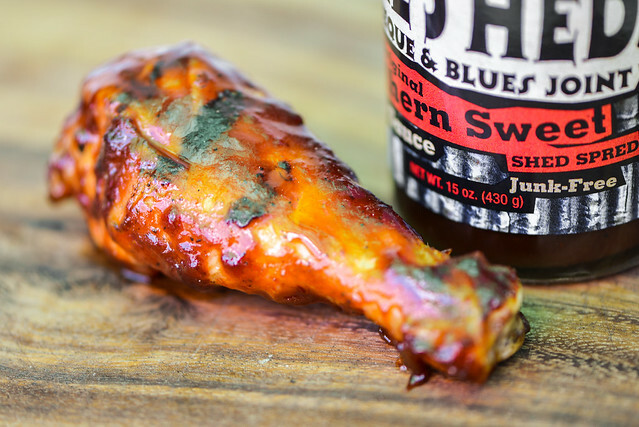 Sweet Baby Rays was one of my go to sauces before trying The Shed's Southern Sweet. I use it for ribs (which I won 2nd place at Oinktoberfest with), chicken, pulled pork, and char-pit chicken wings. It also lacks the junk that Sweet Baby Rays is full of... high fructose corn syrup. Best sauce ever! This sound like a personal vendetta towards Brad. Seems his taste is more to the liking of store brands and Kraft. BBQ sauce is a condiment, not a cooking additive. If you have to disguise your bbq'd meat with sauce before serving, it ain't worth eating. the sauce that is sold on the open market and on the internet is not the same sauce that is used at the shed in Mississippi. They had to make another recipe because of the lawsuit that happened between Poppa Jack's family and the Orrison family. The sauce that got The Shed started was Poppa Jack's who died 1 yr after he went into business with Brad. Good sauce but can't find an expiration date on the bottle so I can't afford to buy it again , had to throw away a half full bottle .